A generic form won’t reflect your specific situation. Every legal issue and every person is unique. These unique situations won’t be reflected in a form that isn’t tailored for their situation. Generic forms are just that, generic. While they will may meet the legal minimums for most states, they should be used for only the most basic situations, if they must be used at all. Generic forms might not comply with Georgia law. Each State has its own laws regarding Deeds, Wills, and other matters such as organization and management of business entities. A generic set of downloaded fill-in-the-blank legal documents may have been drafted to comply with some other state’s law, for example, but might not comply with Georgia law. It is impossible to draft one generic document that meets the standards of all 50 states, unless the document was hundreds of pages long, with a large amount of contradictory terms. Tailored Documents Enhance the Appearance of Legitimacy. They are Much More Likely to be Upheld by a Court Parts of these fill-in-the-blank forms are preprinted, parts of it may be typed and another part of it may be handwritten by the person who purchased it. In this situation someone might be able to contest the will, deed, or other document claiming part of it had been forged. This is because any changes in legal documents leave room for doubt as to who made the changes, and when they were made. People tend to cross out, delete or add words to these preprinted forms. It can be hard to ascertain who made these changes and why. This problem also puts these documents in jeopardy of being contested. In the case of business documents, many small companies need traditional loans or venture capital. Before determining whether to provide financial assistance, lenders and venture capitalists usually want to review a company’s organizational documents. Submitting properly-tailored, (not generic, fill-in-the-blank) documents demonstrates that a company and its owners are serious, organized, and understand the importance of those documents. Given the current economic environment, properly-drafted company documents can make the difference between a start-up company taking off, or never getting that chance. Specific Issues with Wills. You may have seen recently the advertisements on television encouraging people to buy generic forms to complete their wills. They are marketed as a cheap alternative to having a lawyer, the idea being that you will not only have a will (which you should have), but you will also save money. It probably sounds self-serving for a lawyer to tell you to avoid these do-it-yourself kits, but in this article we will attempt to tell you why we believe using these generic forms is a false savings. While you may save a little bit of money, there is a very good chance you will be creating expensive problems for your heirs. These documents are marketed as a “one size fits all” solution to creating a will. They typically include a preprinted form and instructions on how to fill it out. Unfortunately, life is not as simple a pre-printed form, a will needs to be tailored to meet each individual’s particular circumstances. Wills come under state jurisdiction and each state has a different set of laws and rules with respect to wills and the administration of estates. By having a lawyer prepare your will, you are ensuring that your will meets your individual needs and is valid and effective in Georgia. Courts will give great deference to a will, even if it’s not in “perfect” form. But if the law has a requirement that is not met, then no matter how obvious the intent, the law is what must be followed. When in doubt, have an attorney prepare your will. If you are thinking about using generic forms, you are taking a big chance that your wishes and intentions regarding your estate will not come to pass. To be effective, a will must use precise language that leaves no doubt about your intentions. Wording that is vague or conflicts with other wording in the will may give a result completely different than what you intended. This can lead to costly court applications to try to decipher what you really meant, and of course some beneficiaries may be disappointed at the result. The way in which a will is structured is important. The wording in a will must not only be precise, but the various paragraphs dealing with the management and distribution of your estate must follow a particular order to be effective. Because you are completing it yourself, with no legal guidance or the ability to ask questions, it is easy, through wording errors, to complete the form incorrectly with unintended results, or with the result that the will is simply invalid. Your will is one of the most important documents you will ever sign. It has to be right, because you’re not going to be available to make corrections! Approach the preparation of your will with the same caution that you would use in making a major purchase. Who is providing the product, and are they prepared to stand behind what they are selling? The marketers of “wills kits” provide their product with lengthy disclaimers freeing themselves from any responsibility (more on that in the next section),if the “wills kit” doesn’t work and your estate suffers a loss. A will prepared by a lawyer has the lawyer (and the lawyers insurance company) standing behind it. Finally, you should ask yourself: “Am I buying a quality product?” The “wills kit” may be the cheapest product on the shelf, but like any other purchase, you get what you pay for. The Issue of “Dead Guarantees” and Worthless Guarantees. Yes, these will kits may come with some type of guarantee, but what good is a guarantee when you have to be dead to use it? If the Will is not valid, are you likely to know that before you die? 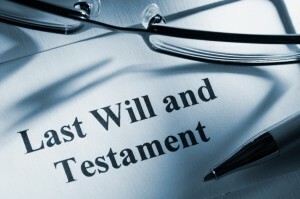 It is labeled as a Will, it looks like a Will, it is even guaranteed to be a Will, so naturally, you are going to assume it is valid, and that validity will never be tested until you die. If there is a problem, your heirs will be stuck with the consequences. In extreme cases, when valid heirs cannot be identified, your entire estate can pass to the State, rather than your family. Look closely at the disclaimers that come with these generic forms (they are usually several pages long in tiny type). You will notice that these companies take no responsibility for any legal issues or problems that arise from the use of their forms. Attorneys cannot have their clients sign these type forms because they are considered unethical. An Attorney must be responsible for their actions, and they cannot require their clients to waive this protection. The long-term cost and risk of using generic forms will probably exceed the short-term savings. Downloading generic forms is free. Hiring an attorney isn’t. But hiring an attorney up front can prevent common (and costly) problems that could have easily been avoided. Bottom line; avoid these generic pre-printed legal forms! Why Choose James T. Johnson, as my General Law Attorney? James T. Johnson, Attorney at Law, has over fifteen years of experience practicing general law surrounding wills, deeds and contracts.